We’ve all been there: wanted to switch the TV or AV Receiver to the DVD or DVR, but can't remember which input it’s connected to. Wouldn’t it be great if there was a feature like PIP for multiple HDMI sources? Silicon Image thought it would, so they developed InstaPrevue. Now, instead of having to guess which device is connected to which input, the user simply calls up InstaPrevue and a thumbnail of all HDMI sources is shown. Back in 2008, Silicon Image developed a technology called InstaPort that provides very fast switching of HDMI sources. 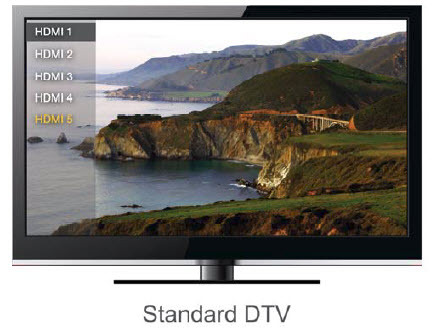 Typically, switching HDMI sources takes 7-8 seconds due to HDCP authentication. 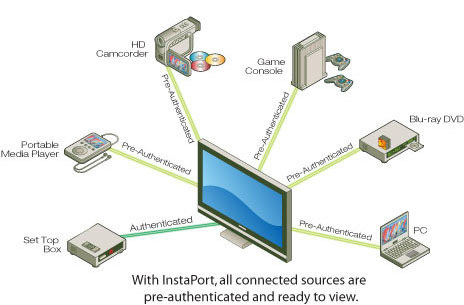 InstaPort solves this problem by using one receiver to display the current input on the display device and a second receiver that continually roves from input to input in the background in order to maintain HDCP authentication. People label their TV/AVR inputs, or at least I do. My TV has 4 inputs, my AVR has 7 HDMI inputs and not one of them is labeled “HDMI1”, “HDMI2”, etc. They have sensible names like “AppleTV”, “Blu-ray”, “AVR”, etc. If you’re going to call up a menu of inputs, you’re more than likely going to see something more descriptive than “HDMI1”, “HDMI2”, etc. in many people’s homes. What I can’t tell you is what percentage of the HDMI-equipped-TV population labels their inputs, so for some it could be a benefit. It means devices are off when not in use. This saves money, is more eco-friendly and probably extends the life of the equipment. For example, when I switch from watching a Blu-ray to watching TV, by pressing my “WatchTV” button, it turns off the Blu-ray player. Why leave it on when it’s not in use? It means that I never (and I mean never) use the “Select Input” button on my TV or AVR. It would even be pointless to do so, as all the sources that are not in use (except the DVR) are off. This doesn’t mean it’s not useful. As we’ll see later it is, just not that useful in the context in which it’s generally marketed. The input must be HDMI: not all inputs are. Some games consoles and set-top boxes do not have HDMI, so InstaPrevue wouldn’t work with those. If you can’t recognize the content you can’t identify the source. When I switch to my AppleTV, unless someone left a TV show or movie playing, I recognize it instantly from the UI or the screen saver. Ditto for my Windows Media Center PC—unless I left set to live TV. So if I have a TV tuner, a DVR, and Media Center PC that are all playing live or recorded TV, how on earth would I know which is which unless I know what content each is currently playing? They all look like live TV so, which is which? We can see this is in the picture with InstraPrevue above. Looks to me like four TV shows. If I’m looking for football, great, there’s something on HDMI3 that looks like football, but if I’m looking for a cooking show on TV, how is InstaPrevue going to help if one of the tuners isn’t on the channel with my cooking show. But wait, the thumbnail also has an input label above it. It sure does, but if it does, why do I need InstaPrevue to switch to my tuner? The label tells me which is which. Where could it be really useful? 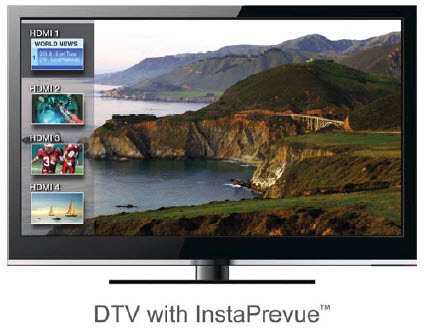 With multiple external tuners/DVR's, InstaPrevue could be used as PIP (e.g. watching one source while watiing for a programme to start on another channel. That said if it shows too many preview thumbnails, it's going to ruin what's being watched on the main screen. Having a control system doesn’t mean that its users won’t use InstaPrevue. On the contrary, and for me, this is where InstaPrevue really makes sense: multiple always-on devices, such as bank of DVR’s (or other tuners). People who buy control systems often have equipment centralized and AV distributed throughout the house. This means they will often have multiple DVR’s that feed several TV’s (typically via an HDMI matrix switch). By using InstaPrevue, someone can see what’s currently playing on each DVR and switch to that DVR. Again only useful if Check Four is satisfied. For an avid sports fan with multiple tuners all tuned to different games, it would be easy to select the correct game on the correct source. This satisfies Check Four, as the user knows what is playing on each device. Another, and probably the best potential use, is in commercial applications. Let’s take my local bar. They have a dozen TV’s and about four cable boxes, so they can choose any one of the four sources on any TV. Let’s say the TV in the corner is playing the cubs game and a customer asks for it to be switched to Real Housewives of New Jersey. All the bartender would have to do, is call up InstaPrevue and look for a thumbnail that looks like Real Housewives of New Jersey. If you’re sold on the idea and feel it would meet your needs, you can find InstaPrevue in 2012 Onkyo AVR’s. DVDO’s Quick6 HDMI switch is due out in early 2013. InstaPrevue is a cool technology, but I feel there are too many prerequisites—(sources being on, tuned to correct channel, having a distinctive UI (at a thumbnail size)—for it to be as useful as advertised in a typical residence. I do believe it has huge potential for commercial applications. For further information, or to InstaPrevue in action, click here.